Scorned by Florida, Irene vented her fury on the rest of the east coast and many inland areas. Reports from Section Managers and other key ARES leaders on critical aspects of response efforts follow. Hurricane Irene produced a significant impact across Massachusetts, Vermont, and much of New York and New England. Tracking of Hurricane Irene started when the system was in the Bahamas, and Turks and Caicos Islands and the National Hurricane Center "cone of uncertainty," which is a cone that describes track uncertainty for the center of the hurricane to reach a particular location, covered much of southern New England on Tuesday, August 23. During this timeframe, the first coordination message to Amateur Radio and non-Amateur Radio SKYWARN Spotters, Emergency Management and other agencies was posted to the SKYWARN email list covering the National Weather Service Taunton, Massachusetts coverage area. Messages were issued once per day through Thursday, August 25 and were increased to two messages a day on Friday as Tropical Storm and Hurricane Watches and Warnings were posted for the region. These messages were also posted via Facebook and Twitter as listed under the WX1BOX, Amateur Radio station at the NWS Forecast Office, social media Web sites and on the WX1BOX home page so that spotters could prepare and then be in position to report severe weather conditions. From an ARES perspective, a call between the Section Emergency Coordinator, Assistant Section Emergency Coordinators and senior ARES staff members was held Tuesday evening. This ramped up to the entire staff of DECs, ASECs and the SEC by Wednesday evening and were held nightly with two calls held on Saturday. A follow-up call was held late Sunday afternoon. The Western Massachusetts section also participated in the calls and coordination between the Eastern and Western Massachusetts ARES SECs took place throughout the event. Eastern Massachusetts ARES was placed on stand-by on Thursday, with deployments all day Sunday, August 28. The Eastern Massachusetts ARES Stand-by Status was lifted the following Tuesday when conditions across the area had improved sufficiently that no further agency requests were anticipated and power slowly returned to people in the region. Information on the ARES stand-by and agency deployments was posted to the Eastern Massachusetts ARES web site. In the Eastern Massachusetts section, two town EOCs and one school Amateur Radio station serve as control points within the section to maintain contact with the various ARES and SKYWARN Nets in the region. They are located in the town of Acushnet (WA1EMA) led by South Coast Massachusetts EC Ed Caron, KA1RSY, the town of Bridgewater led by Assistant SEC Carl Aveni, N1FY, and at the Dexter-Southfield School/Clay Center Observatory in Brookline, Massachusetts (WX1CLA/W1CLA) led by Metro Boston DEC Marek Kozubal, KB1NCG. In addition, the National Weather Service Forecast Office in Taunton (WX1BOX) was also staffed with Amateur Radio operators that included Eastern Massachusetts SEC Rob Macedo, KD1CY, John Bacon, K1JWB and soon to be licensee Nick Snow. Coordination took place between WX4NHC, the Amateur Radio station at the National Hurricane Center in Miami, Florida, and the WX1BOX NWS Taunton Amateur Radio station. In the Western Massachusetts section, SEC John Ruggiero, N2YHK, placed ARES on stand-by on Friday, August 26. Amateur Radio operators supported a minimum of 12 EOCs in his section. In the commonwealth of Massachusetts, there is no county government and counties only represent a geographical collection of towns so staffing takes place at the local and town level with some smaller cities and towns having one EOC centrally located between them. Also staffed were the Pioneer Valley Chapter of the American Red Cross where staffing was continuous from Sunday, August 28, through Friday, September 2, the Greenfield Community College Regional EOC and the Berkshire Medical Center in Pittsfield, Massachusetts. In terms of shelters, a minimum of 11 shelters were staffed across western Massachusetts. Several dozen local city and town EOCs were also staffed in the Eastern Massachusetts section. The city of Boston EOC was staffed with Amateur Radio operators for the first time in an actual storm related event. In the past, it had only been staffed during the Boston Marathon and major events such as the Democratic National Convention in 2004. Several regional Red Cross shelters were staffed with Amateur Radio operators across the section. This included seven shelters and the Red Cross headquarters on Cape Cod and three shelters and a Red Cross base outside of Cape Cod. Cape Cod DEC Frank O'Laughlin, WQ1O, led Cape Cod ARES operations. In addition, North Shore ARES supported the Beverly and Bay Ride Hospitals and the Peabody, Massachusetts EOC. Assistant SEC Jim Palmer, KB1KQW, and North Shore DEC Eric Horwitz, KA1NCF, led these operations. The Cape Ann Amateur Radio Association supported the Gloucester EOC and the Gloucester Hospital with hams at each location. South Shore DEC Phil McNamara, N1XTB, reported numerous town EOCs staffed including the towns of Carver and Mansfield. Also, for the first time, the FEMA Region 1 Maynard Federal Response Center was staffed with an Amateur Radio operator, Kate Murphy, KB1USO, Metro Boston EC, providing a link to their center for the first time in a storm related incident. One of the major roles ARES and SKYWARN play in the commonwealth of Massachusetts is providing situational awareness and disaster intelligence information during a weather event and in a hurricane it is no different. ARES-SKYWARN operations lasted 19 hours. In the 19 hours of activation, amateurs at the NWS Taunton Forecast Office handled several hundred reports of wind damage, storm surge, flood measured rainfall and wind reports from across the entire coverage area, which is all of Massachusetts except for Berkshire County, Rhode Island, Northern Connecticut and Southern New Hampshire. Approximately a dozen SKYWARN nets were stood up across the region to support the reporting from all areas. These reports were distributed to state and federal emergency management officials as well as the media. At the height of the storm, over 600,000 were without power in Massachusetts with over 1,000,000 without power in Massachusetts, Rhode Island and Connecticut combined. Measured wind gusts between 70 and 80 mph were reported by Amateur Radio operators and this information was sent directly to the National Hurricane Center via the VoIP Hurricane Nethttp://www.voipwx.net, which was merged with the Echolink/IRLP New England Reflector system. Some amateurs were directly impacted by the storm with trees falling on their houses from the high winds and many hams lost power but were able to remain on the air through emergency power backup. Amateur Radio operators were key in providing what was happening during the hurricane in near real-time to public safety officials. This was particularly true in Western Massachusetts where major flooding shut down major highways such as Interstate 91 and almost cut off entire towns in Franklin County and parts of the hill-towns of northwestern Massachusetts. Some of those first reports of major flooding came from Amateur Radio operators. Western Massachusetts SEC N2YHK alerted Eastern Massachusetts ARES on the potential need for ARESMAT support to Franklin County as one shelter was filled to capacity and a second shelter was opened with communications in the area spotty due to hilly terrain and the stress the flooding had caused on the communications infrastructure. Irene's impact to the region was that of a strong tropical storm/minimal category 1 hurricane. Its large wind field that expanded to between 250 and 300 miles along with its heavy rainfall caused significant issues over a widespread area from North Carolina through New York and New England. It shows that all tropical systems are dangerous and there is little difference between a strong tropical storm versus a minimal category 1 hurricane particularly where the wind field is as large as Irene and the tremendous amount of rainfall the system had. Over 200 amateurs supported the operation between deployments and SKYWARN Net support in Eastern Massachusetts. At least 65 amateurs from Western Massachusetts participated by providing services in direct support of those deployed in the field. There were many more that provided storm reports and net assistance, as well as supporting logistics and administration. After action reports are still being compiled. They will eventually be posted to the Eastern Massachusetts ARES Web site, Western Massachusetts ARRL web site and the NWS Taunton SKYWARN WX1BOX Web site with notifications sent over Facebook and Twitter as well. These reports will include the the names of amateur operators that deployed to the various agencies and other lessons learned from Hurricane Irene. [Contributors: Mike Neilsen, W1MPN, former Eastern Massachusetts SM and OES; John Ruggiero, N2YHK, Western Massachusetts SEC; principal author Rob Macedo, KD1CY, Eastern Massachusetts SEC, ARES SKYWARN Coordinator for NWS Taunton Massachusetts, and Director of Operations for the VoIP Hurricane Net; and Carl Aveni, N1FY, Eastern Massachusetts ASEC and Assistant ARES SKYWARN Coordinator for NWS Taunton Massachusetts]. In North Carolina, Section Manager Bill Morine, N2COP, reported that commercial network infrastructure remained largely intact, but emphasized "that this was the first large scale disaster in the state since ARES EC and higher appointments required ICS 100, 200, 700 and 800 training and certification." Morine said that "55% of the state's 100 counties now have ICS-credentialed ECs, and there are almost 400 ICS-credentialed operators in ARES. The result was that emcomm assignments were effected like clockwork in conjunction with our primary served agency: North Carolina Emergency Management (NCEM)." Morine said that "after the storm passed, many ICS credentialed ARES personnel reported to the agency's Eastern Branch Regional Coordination Center (RCC) in Kinston, where communications for the affected areas in the Outer Banks were being handled. This was the first time in the state that we also had several COMM-Ls (Communications Unit Leader) being used. This storm response validated the NIMS/ICS system, and showed that it's working well here in North Carolina." Morine thanked the state's operators: "Much appreciation goes to the thousands of operators across the state who got on the air to help with Hurricane Irene emergency communications. Hams in the northeastern counties and on the Outer Banks saw tremendous damage. The Tar Heel Emergency Net (THEN) was on the air almost continuously." 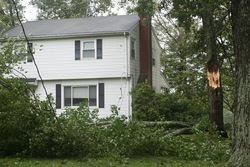 In Connecticut, veteran Section Manager Betsey Doane, K1EIC, reported that Hurricane Irene "sure visited" her state/section: "We have not had an emergency of this scale in some time." Preparations in the state began with SEC Wayne Gronlund, N1CLV, ASEC Rod Lane, N1FNE, and K1EIC convening a net of ARES and NTS ops to review plans and procedures for the emergency and to update all on the status of the SEC's plans for activation. More than 80 operators checked in. "We do not have county government in the state," Doane said. "Our Section is divided into five Emergency Management regions. During the hurricane, SKYWARN nets were activated every two hours and NWS stations were also operational. SKYWARN DEC Steve Williams, K1SJW, and his net managers and net control stations performed yeomen's work coordinating and controlling the many nets. There were 98 check-ins from Hartford and Tolland counties alone. The operator of WX1BOX at the National Weather Service Office in Taunton, Massachusetts, checked into the Hartford Tolland county nets on the 146.79 MHz Pioneer Valley Repeater Association repeater throughout the storm. WX2ALY at the National Weather Service Office in Albany, New York checked into the Litchfield County nets through the 147.285 MHz Southern Berkshire ARC repeater in Sharon that is tied into the KB1AEV system. SKYWARN nets in Windham County used the K1VSC W2LK Airmail system to send reports to the NWS office in Taunton, Connecticut SKYWARN, ARES leadership and DEMHS Region #4. DECs in each region reported that they had hams in several EOCs and at Red Cross shelters. Linked repeater systems were all active and used shared resources. Both Flexnet and State Police packet networks as well as some Winlink RMS's were fully operational. Doane said her emcomm team "is very appreciative of our repeater and digital system owners and operators who are committed to public service. It takes a lot of work and expense to run these systems." She reported that "we kept our membership informed on the air and through our ARES reflector and Section Web sites when we had Internet availability." Doane's leadership team, which is affectionately called "the CALC," the CT ARES Leadership Council, met regularly on the air to share status updates. Unfortunately, some clubs lost power at repeater sites and others lost entire repeater systems. On the NTS side, all nets were active with great participation. A welfare message was given to Doane by ASM K1HEJ from an op in Vermont inquiring about his brother in Milford. Doane couldn't get through on the phone but new DEC WA1SFH successfully delivered the message in person and got a "good news" reply back. ARRL PIC KA1WPM distributed news releases about ARES operations and participated with the SM and SEC in a Web conference with ARRL staff conducted by ARRL Emergency Preparedness Manager W5MPC. Doane thanked the ARRL staff for their vigilance and continuing offers of support. Trees and wires down at the home of Connecticut SEC Wayne Gronlund, N1CLV: All antennas and his Mobile Comms Unit remained intact. (photo courtesy SM K1EIC). outstanding communications work. New relationships were formed in the Section. Amateur Radio communications with the city of Stamford led by EC WB2RYV, who participated in planning meetings with city officials, is one example. In Eastern Pennsylvania, Section Manager Eric Olena, WB3FPL, reported that "shelters in most counties were open for two to three days with lack of power being the main concern. There was flooding in only a few areas." New Hampshire Section Manager and SEC Al Shuman, K1AKS, was situated at the State EOC and saw firsthand both on the HF and VHF sides how well things went: "We had a number of repeaters go down as electricity failed. I was impressed on how well our troops dealt with adversity to keep things going." ARRL HQ went into monitoring mode on Irene long before she made landfall in North Carolina. Thanks to Angel, WP3GW, Public Information Officer for ARRL's Puerto Rico Section, we were getting reports on Irene as she made her way across Puerto Rico and the Caribbean. On Tuesday August 23rd the ARRL HQ Emergency Response Team went into monitoring mode for Irene. The decission for activation came later in the week as Irene's path became more certain. ARRL hosted conference calls for Section officials in Irene's path and issued daily updates on related activities. Irene's impact on the east coast fell on a weekend when HQ would normally be closed. To assist the affected Sections W1AW was staffed and on the air from 0700 local Saturday through 1400 local Sunday. Station operators monitored traffic nets, assisted with relays, passed traffic through the Hurricane Watch Net and through NWS Taunton, MA. One kudo that should be mentioned is to Sean Kutzko, KX9X, ARRL's Contest Branch Manager. Sean gave very generously of his time over the weekend of Irene's landfall. He spent many hours at W1AW passing storm related traffic to NWS Taunton via Echolink. Many times I hear of the divide between EmComm and contesting, but it is a divide created by us. When there is a true emergency and we (the Amateur Radio Service) are needed, we come through regardless of our differences or interests within Amateur Radio. To Sean and all those that step up to plate when called upon...thank you! Special thanks to HQ staff who helped keep W1AW on the air over the weekend; KX9X, NJ1Q, K1FUG, N1ND, W3IZ, WV1X, NC1L, AG1YK, and KA1JPA. "EmComm for the Apocalypse" is the title of a presentation to be made at the ARRL PACIFICON 2011 convention next month in Santa Clara, California, by David Kidd, KA7OZO, of Oregon ARES/RACES and Bart Lee, K6VK. The subject is electromagnetic pulse (EMP) and emergency communications. "If your gear is solid state, it's cooked unless it's protected," said Lee. PACIFICON 2011, The Great West Coast Ham Radio Convention, returns to the San Francisco Bay Area and will again be sponsored by the Mount Diablo Amateur Radio Club. PACIFICON 2011 will take place Friday, October 14 through Sunday, October 16, at the Marriott Santa Clara Hotel. This nationwide exercise is the chance to test your emergency operating skills and the readiness of your communications equipment and accessories in an emergency-like deployment. ARRL Field Organization Leaders at the Section and local levels -- along with many other volunteers who are active in public service and emergency communications -- are developing emergency-like scenarios in consultation with a variety of agencies for whom radio amateurs are known to provide service during emergencies. To find out how you can step up and be a part of the local or Section-level activities, contact your Section Manager. You can find contact information for all 71 ARRL Section Managers on page 16 of any issue of QST. Additional contact information may also be found on the ARRL Web site. ARES®, the National Traffic System (NTS), the Radio Amateur Civil Emergency Service (RACES) and members of the ARRL Field Organization will participate and practice emergency operation plans, nets and procedures. GlobalSET is an exercise taking place twice annually, usually in April/May and November. Participants are headquarters stations of national IARU Member-Societies and of stations of specialized emergency communications groups world-wide. GlobalSET is not a contest, but an exercise; messages are being exchanged between stations and forwarded to a regional headquarters station in each of the three IARU Regions. In addition to the training of operators in message handling, GlobalSET also aims at increasing the awareness for the global and regional Center of Activity (CoA) Frequencies. GlobalSETs are sponsored and organized by IARU Region 1 and regularly announced on the IARU web site with a link to the rules and details for each event. With recent events such as the Japan earthquake and Hurricane Irene still fresh on the mind, I was heartened to read David Sumner's (K1ZZ) astute opinion on the changing role of Amateur Radio in emergency communications in the September 2011 issue of QST. In a world of social media, real-time crisis mapping, and pervasive smartphone use, the role of Amateur Radio is indeed changing, even as we remain a core tool in the communications toolbox. David's essential point assumes that a successful response to any significant emergency requires different agencies and organizations working together in a collaborative and trusting manner. Unfortunately, just a few pages later Rick Palm's (K1CE) article about the Florida-based EMCOMM-1 vehicle does a fundamental disservice to that trust. No, it's not about the vehicle: from what I read and have seen online, it seems to be a fine vehicle and its builders are to be commended for their efforts. What I take exception to was the hyperbole and explicit attitude that said "Hams do it better than government - look how wasteful and incompetent they are." This "us versus them" attitude is exactly what is NOT needed in modern emergency response, and unfortunately only reinforces the negative stereotypes held in certain served agencies of the Amateur Radio service. The attitude is wasteful, and serves no useful purpose. One of the things that jumped out at me in the wake of Hurricane Irene was how far the ARRL HQ's planning, preparation and response initiatives have come since the old days, when I was responsible for them. Back in those days, the HQ response was mostly reactionary, as opposed to pre-planning and coordination protocols. Some of that changed after Hurricane Hugo, but the quantum leap for HQ's emergency response and planning came with the vision of the executive management at HQ, especially Chief Operating Officer Harold Kramer, WJ1B. Staff was hired with the dedicated mission of ramping up HQ's emergency preparedness and response, and most importantly, support to the field, and coordination. They have done an excellent job. A good example of the manifestation of this new era was the "webinar" convened by ARRL HQ's Emergency Preparedness Manager Mike Corey, W5MPC, before the storm was to impact the east coast. The purpose of the Internet-based meeting was for ARRL Sections in the path of Irene to provide a brief update on Amateur Radio activities. Section Public Information Coordinators, Section Traffic Managers, and other key Section level staff were invited to attend. These section staffers would provide information from key Section staff in the overall update. A spokesperson for each Section was named, and briefings from nineteen Sections were conducted. A synopsis of Amateur Radio activity in each Section ahead of Irene was provided, along with any anticipated needs, HF emergency net information, Echolink/IRLP, and D-STAR nets operating, and a back up point of contact for each Section. Good job, HQ.